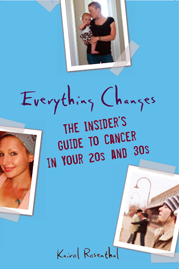 Everything Changes – The Guide to Young Adult Cancer » What makes someone HOT? Sift through the Cosmo line up of The Hot Bachelors 2008. You’ll see white teeth gleaming on your screen, ripped six pack abs, and brown sugar tans. You’ll also see a boat load of mortgage bankers, sales reps, and for some reason dentists and dental school students. But the hottest of them all (and the rest of the country agreed) is Brad Ludden. A world-class professional kayaker, Brad started the non-profit organization First Descents, which leads kayaking and climbing excursions for young adults with cancer. Most young adult cancer organizations are started by young adults with cancer. Brad does not have cancer. He started this organization because he identified a way that his skills, media attention, and connections could benefit others. Now if you ask me, there is nothing hotter than that. Apparently others agree; Brad won the contest and will donate the $10,000 prize to First Descents to pay for ten young adults to go on kayak trips. Have any of you ever been on a First Descents excursion?